1000 speaker bureaus submitted their top ten speakers from all over the world. 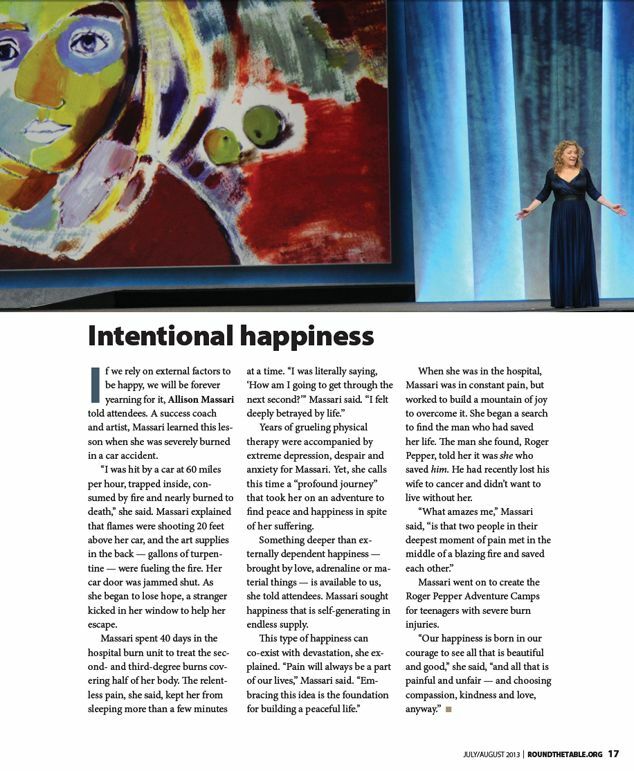 After a rigorous selection process that lasted six months, Allison Massari was one of a 12 chosen to speak on the main platform at the Million Dollar Round Table Conference in Philadelphia, Pennsylvania, June 8-12, 2013. The crowd of 8,600 people included those from 75 countries. "Your talk on the MDRT Main Platform was fantastic, and it was even better to get to know you... You really are an inspiration, and made such an impression on me." In her words: "Incredible! .... 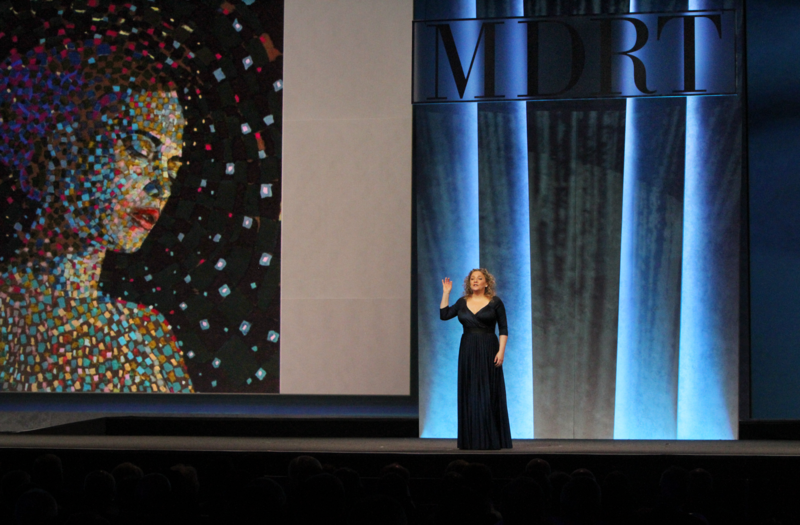 The event in Philadelphia at MDRT was extraordinary and I am so thrilled, humbled, and overwhelmed with feelings of gratitude. People were here from 75 countries with a final headcount of 8,600 (including special guests). They had more translators there than the United Nations! The gift I was given to be here is beyond words. Every aspect of the event was planned with precision like I have never seen. One of the many poignant moments for me happened backstage after my speech. There were two long rows of small sound booths set up side-by-side with interpreters for each country inside each booth. And I entered each one-by-one to thank them individually - The first booth was China. It was magical because it was like we were old friends because they had seen and heard me already. We embraced and there was much emotion and we held hands and I thanked them for their hard work and for the GIFT they gave me by being a bridge for their people to understand me. I explained how much I appreciated that without them, people from their country would never have heard my message. The next booth was Bahasa Indonesia, and the next Cantonese, then Greek, then I peered my head in to Hindi, then Japanese, Korean, Bulgarian, Vietnamese, Mandarin, Polish, Portuguese, Spanish, and by the time I entered the next booth and the men enthusiastically said, "Thai!!" I began sobbing. 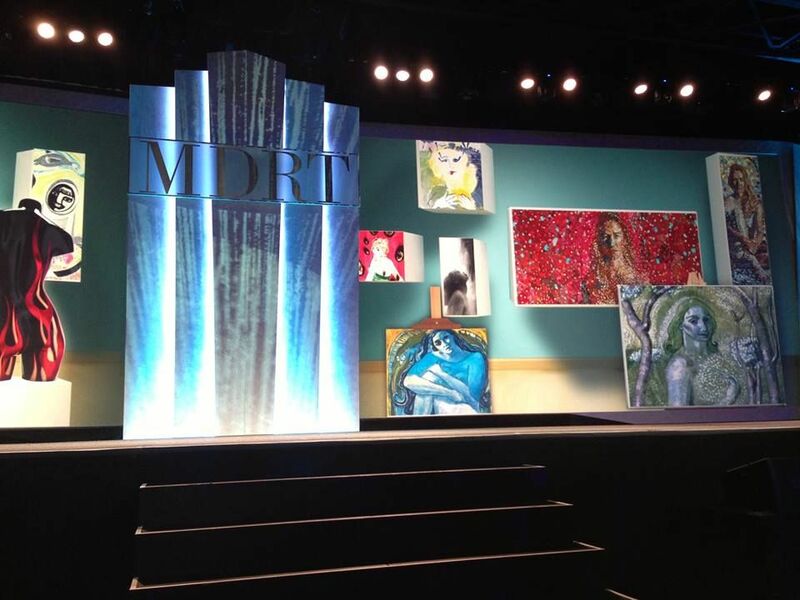 I was overwhelmed seeing that MDRT had taken me all over the world in one day. Many doors were opened. It was so humbling. And my soul felt at peace - Some sort of a longing inside of me was quenched. For the rest of the day I was on the edge of tears of gratitude. This is one of many magic moments that these last several days have given me and I thank God, my mentors, my friends, my family and everyone who has been by my side for so many many years on my journey to get here." 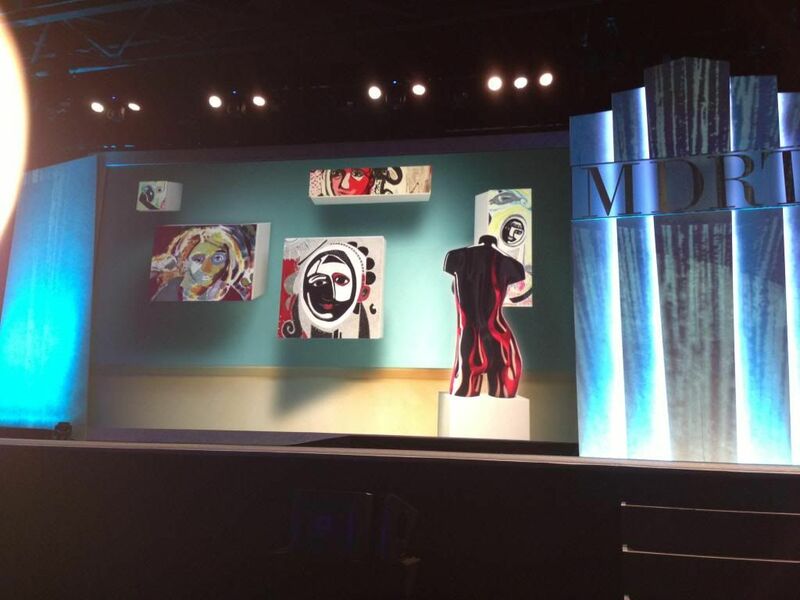 The production company for the event Williams/Gerard did an outstanding job including this exceptional stage background they created with all of Allison Massari's artwork.